Question 1: What are you reading, these days? Denzel Washington: Books? I don’t have time. Question 2: What’s on your iPod? Denzel Washington: Lenny Kravitz. I have all his stuff. All of James Brown, the Beatles, the Rolling Stones, everything from blues to gospel to jazz. More than 5,000 songs. When getting to know someone we all have to engage in Small Talk. As a language learner it can get boring. It seems like you are always making small talk when you really want to talk about deeper or complicated subjects with people. However, I just think of Small Talk as a step toward deeper/more complicated conversations. Most people don’t suddenly start having deep conversations with people they don’t know so well. So we need to start with simple topics first. The first answer about books is quite a common speaking style. 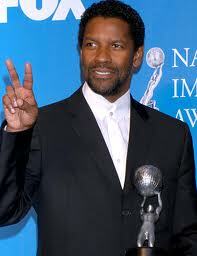 Denzel uses a rhetorical question because he feels a bit inwardly surprised. Then he gives a truthful answer. In conversation, it isn’t the best idea to say something negative but it gives him legitimacy. If you do use a negative style make sure the rest of your answers are positive style answers. Positive answers are usually a better way to create more conversation. …everything from blues to gospel to jazz. …everything from blues to gospel. In his final sentence he shows his passion for music. He tells us that he has more than 5,000 songs in his iPod. Denzel loves music! This also ‘ties’ the answer idea into the question idea smoothly. The language is natural, informal, and passionate. He starts with a negative answer but finishes with positive information filled answer. With simple English he has created a HIGH CLASS ENGLISH STYLE OR GREAT COMMUNICATION! He has signaled to the listener that he is open to more questions. We are moving forward into deeper/complicated English conversation topics. Now you try it! Have fun at your next English Party! Denzel Answer 1: Books? I don’t have time. Denzel Answer 2: Lenny Kravitz. I have all his stuff. All of James Brown, the Beatles, the Rolling Stones, everything from blues to gospel to jazz. More than 5000 songs. Answer 1: Books? I don’t read very often. Answer 2: SEAL. I have all his stuff. All of Ricky Martin, Theory of a Deadman, Bon Jovi, everything from Latin music to alternative music to rock n roll. More than 1000 songs. Answer 1: Books? I don’t read so much because of my work. Answer 2: Britney Spears. I have all her stuff. All of Lady Gaga, Linkin Park, the Dixie Chicks, everything from pop to rock to country. More than 2000 songs.